PCSAT2 HAS RETURNED TO EARTH: After a final month of special communications experiments with the FM Voice repeate, PCSAT2 was recovered from the outside of the ISS by astronauts on the 3rd EVA of mission STS-115 and it has now been returned safely to Earth. This is the first Amateur Radio Satellite that has ever returned intact and operational. We look forward to opening it up and seeing what a year in space has done to it. We hope to follow up with future missions (PCSAT3). 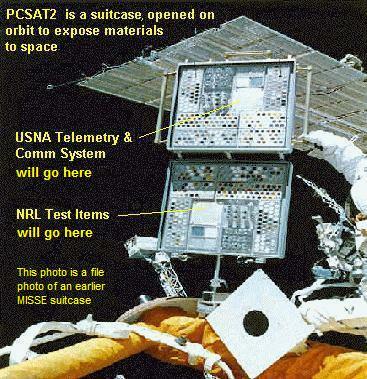 PCSAT2 BEGAN OPS on 3 Aug 2005: PCSAT2 (looks like an astronaut suitcase) was installed by astronaut Soichi Noguchi on the outside of the ISS on 3 Aug during EVA3. 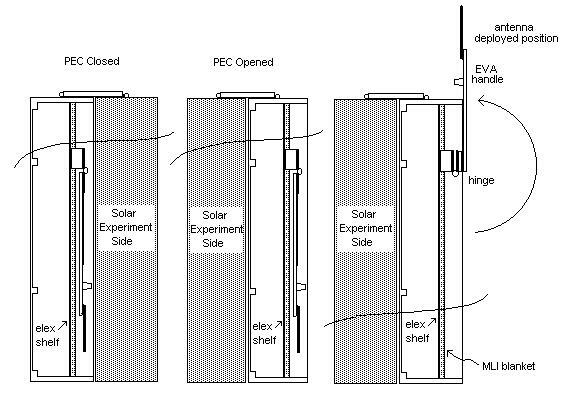 The left photo is the suitcase in his left hand with the Solar Cell side which should face the sun. 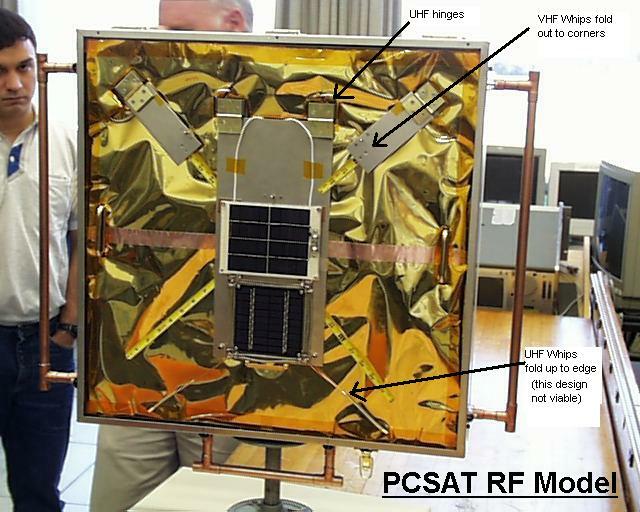 The right photo is the backside with PCSAT2 electronics under the gold colored thermal blanket. 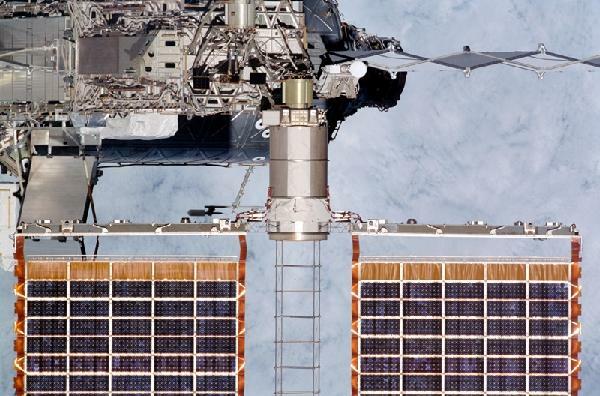 The ISS P6 truss and ISS solar array axis are in the background. There are some tape samples on its outside to see how they weather in space. See our summary of day 1 activities. PCSAT2 completed a 4 week test of its PSK31 Transponder mode and is now operating in APRS Packet Digipeater mode. It is also producing good solar cell science data being collected by special ham radio volunteer ground stations around the world. You can see the live telemetry on the web. 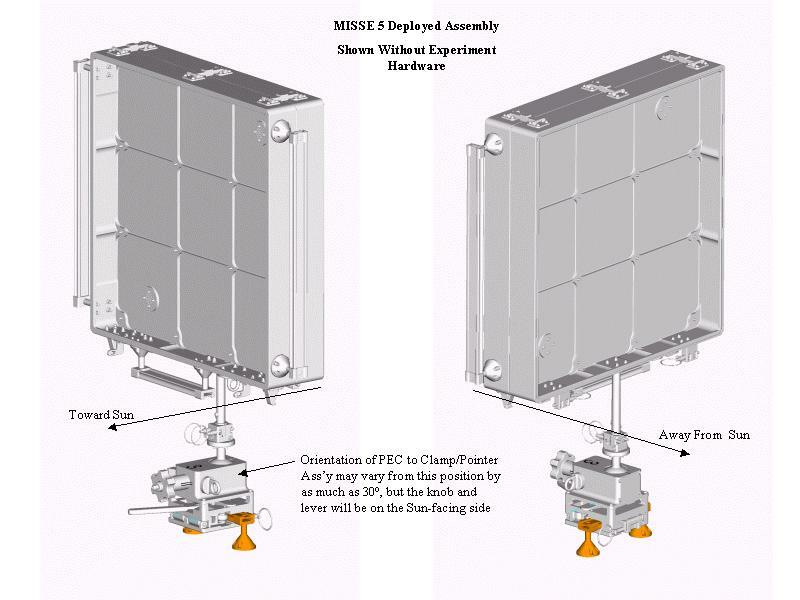 Announcements will be made on the AMSAT-BB Email reflector. PCSAT2 OPERATIONS: The PCSAT2 Operations web page is used for informing ground stations and volunteers. Currently our main objective is to collect the solar cell science data and support user packet radio communications experiments with a 145.825 uplink and 435.275 +/- 10 KHz Doppler downlink. 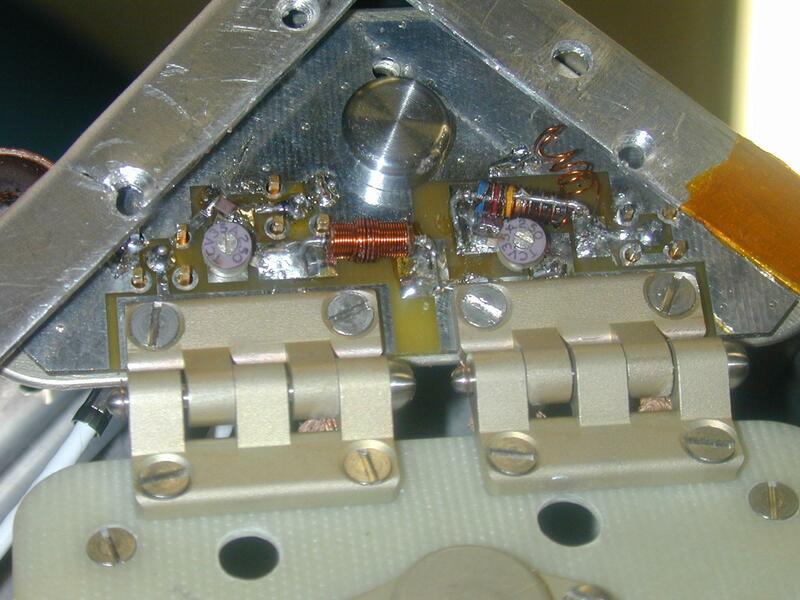 Experiments were conducted for the first 4 weeks with the PSK-31 transponder showing excellent signals at the beginning with only a 4W 29 MHz uplink signal. But after a few weeks the receiver has faded and it takes 100W or more to be heard. This mode is now considered not operational. 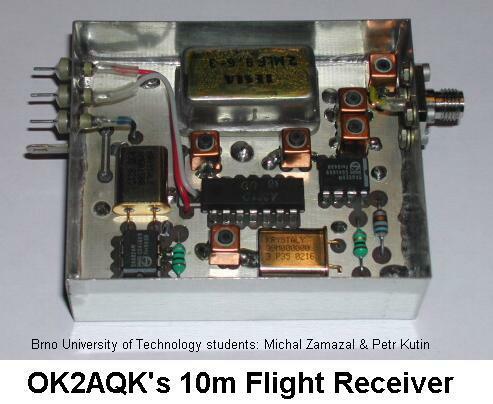 See the image of the first PSK signals we heard through the PSK-31 transponder. 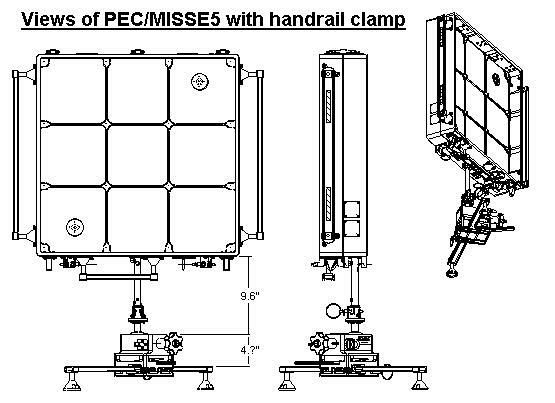 PCSAT2/MISSE5/PEC: MISSE is a Materials International Space Station Experiment using a Passive Experiment Container (PEC) to fly space environment samples to space and back. It has flown 4 times including a year on MIR as MEEP. 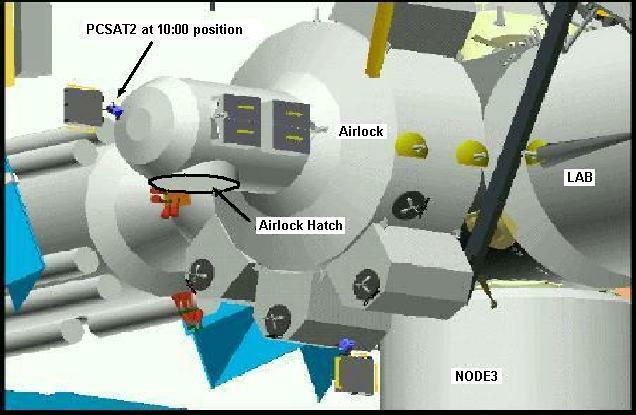 It is attached to the exterior of the ISS during an EVA to expose its samples to space as shown below. 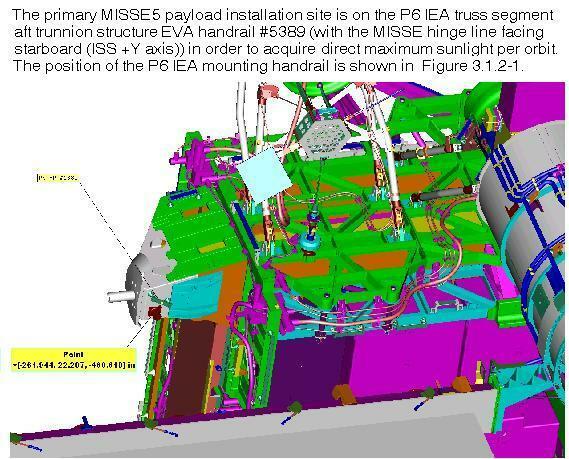 MISSE5 was assembled at the Navy Research Labs, with samples of high-tech DOD solar cells on the side of MISSE that faces the sun. 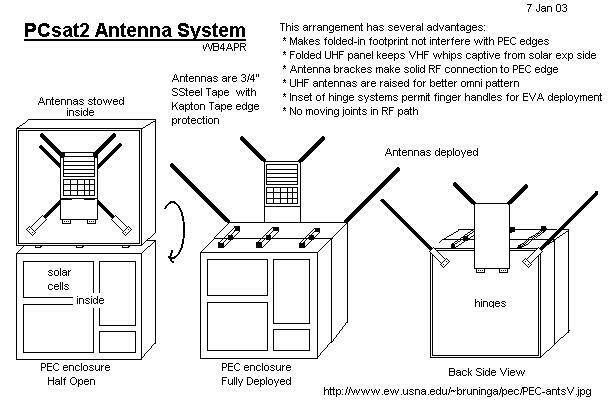 On the back side, the Naval Academy has provided an Amateur Satellite Communications system similar to what it is flying on PCsat . It supports educational and student outreach objectives of both AMSAT, ARRL and NASA as well as provide telemetry on the health of the system. 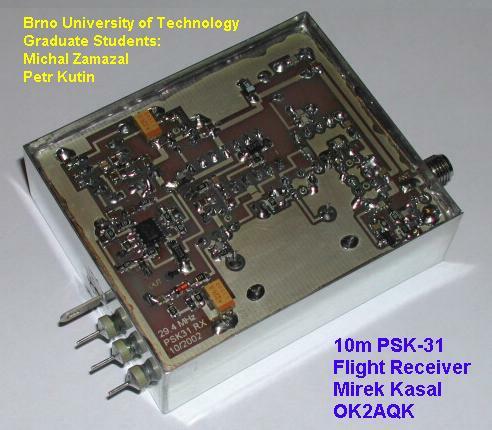 The PCSAT2comm system operates in the ITU Amateur Satellite Service in cooperation with ARISS and can provide a PSK-31 multi-user transponder, an FM voice repeater for possible use with ISS Crew communications and an AX.25 packet system for possible use as a UI digipeater and for telemetry, command, control as shown in the block diagram. The PEC is basically a suitcase for travel that opens in space as shown above. 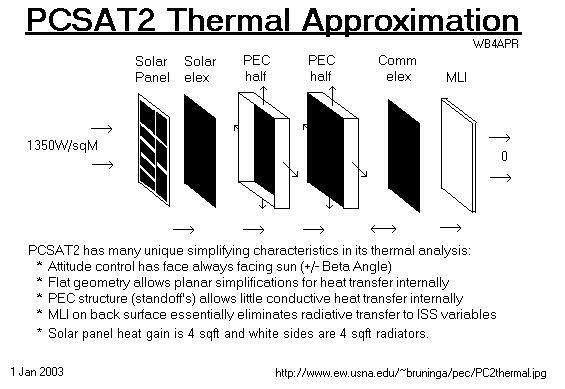 The solar panel side of the PEC contains new technology solar cells and telemetry from PCSAT2 will include data on the techincal investigation of the radiation effects on these cells. See the Paper on PCSAT2's operation in the Amateur Satellite Service or the Full ITU rules as published by the IARU . 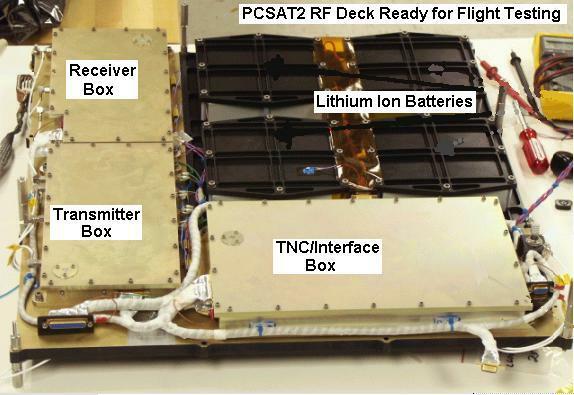 SPONSORING ORGANIZATION: The PCSAT2 project is conducted under the USNA Small Satellite program with the guidance of LTCL Billy Smith and Satellite Lab Senior Research Engineer, Bob Bruninga, WB4APR. The USNA Amateur Radio Club is the spacecraft operating organization. Since PCSAT2 is flying on the ISS, its operations will be fully coordinated with the ARISS (Amateur Radio on the ISS) international team. 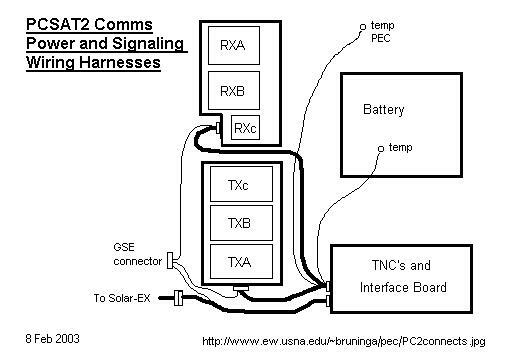 PCSAT2 DESCRIPTION: PCSAT2 uses the same dual redundant AX.25 command and control system as used on the original PCsat (NO44) offering 8 on/off commands, 20 telemetry channels and a serial port for the solar cell experiment telemetry. It also supports the Digital Comms Relay support of the PCsat/APRS mission. The uplinks are on 2 meters and the downlinks are in the 435 MHz band to avoid any possible interference with existing ARISS 2 meter operations. 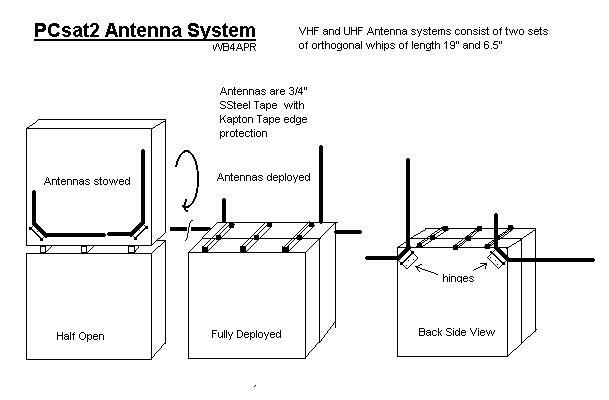 Observers will note that this is exactly opposite of the long range plan for all ARISS downlinks on 2 meters and uplinks on other bands, but it had to be this way, beacuse at the time of the PCSAT2 design freeze in Dec 2002, there was no equipment on ISS capable of cross band operation. 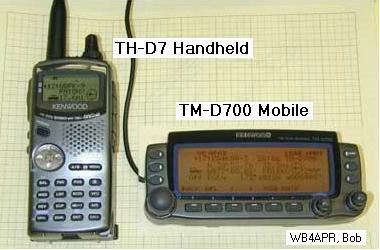 The Kenwood D700 was not to arrive for several months later. 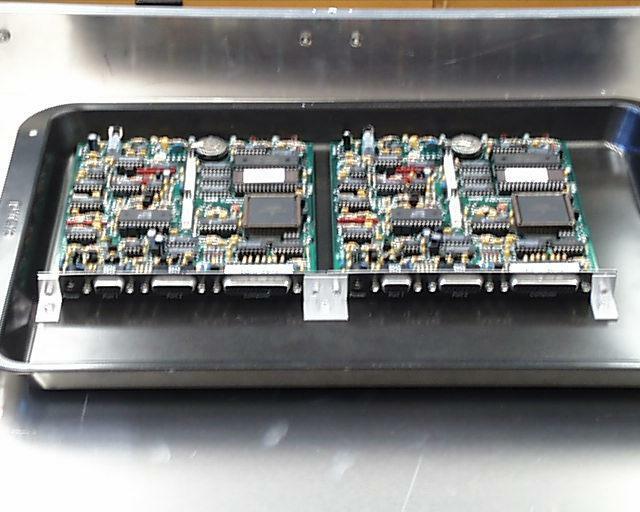 Unfortunately the 2 year Shuttle delays allowed the D700 to arrive on ISS before PCSAT2 but long after the PCSAT2 design freeze which required it to operate down on UHF. 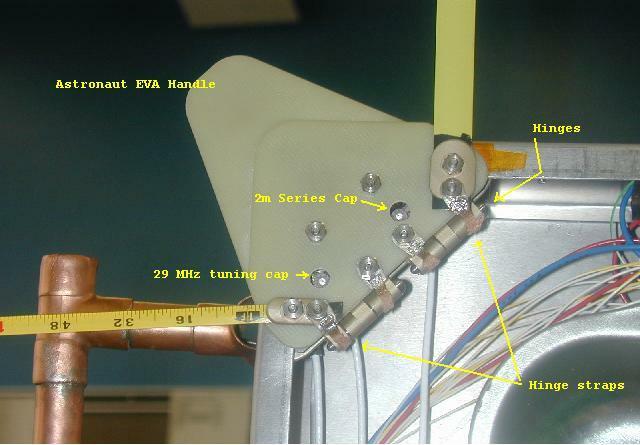 PCSAT2 has quad redundant transmit inhibits for EVA safety issues Also, the mission lifetime of PCSAT2 is only 1 year, because it is a sample-return mission, thus terminating any long term conflicts in spectrum management. 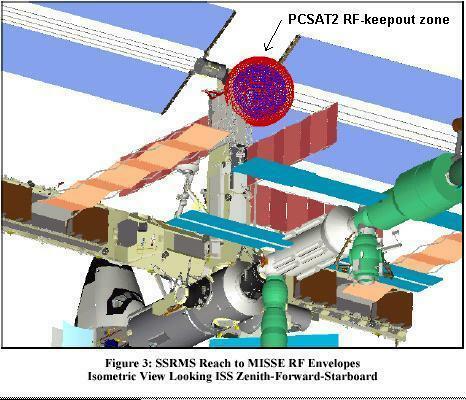 After PCSAT2 is removed from ISS, then hopefully all future ISS Amateur Radio missions will use 2m downlinks and other bands for uplinks to avoid any operational interference between modes. 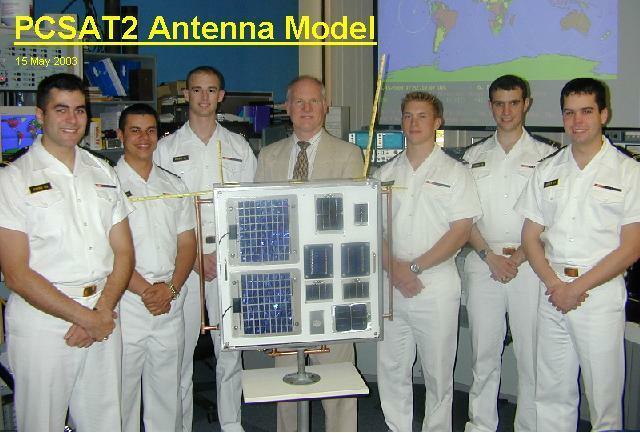 Other midshipman photos: PCSAT2 prototype, Antenna SWR measurements, Radio configuration. BAND PLANNING: One of the key issues with any Amateur Radio experiments on ISS is the requirement to avoid any mutual interference between systems. 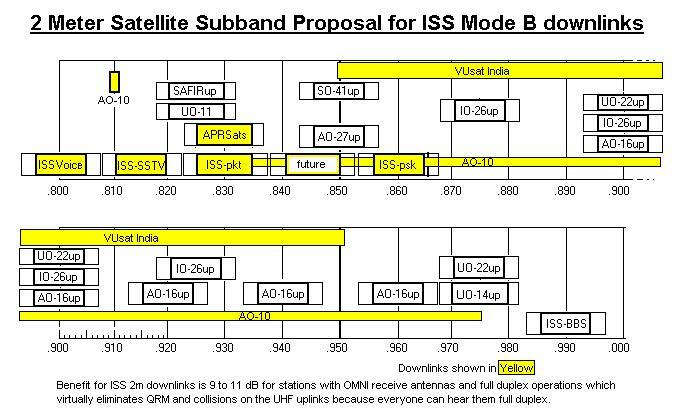 For this reason, future systems will probably move all uplinks and downlinks on ISS into separate bands. This is so that multiple uplinks and multiple downlinks can be going on simultaneously. 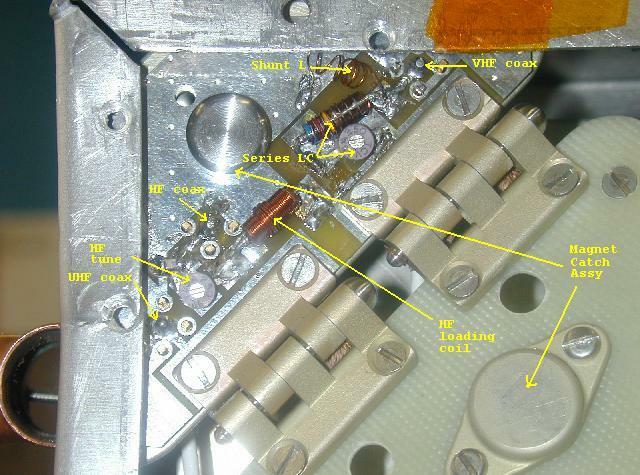 At the time of the PCSAT2 design freeze (Dec 02), ISS operated with both uplinks and downlinks on 2m, thus, 2m was only available as an uplink to PCSAT2. 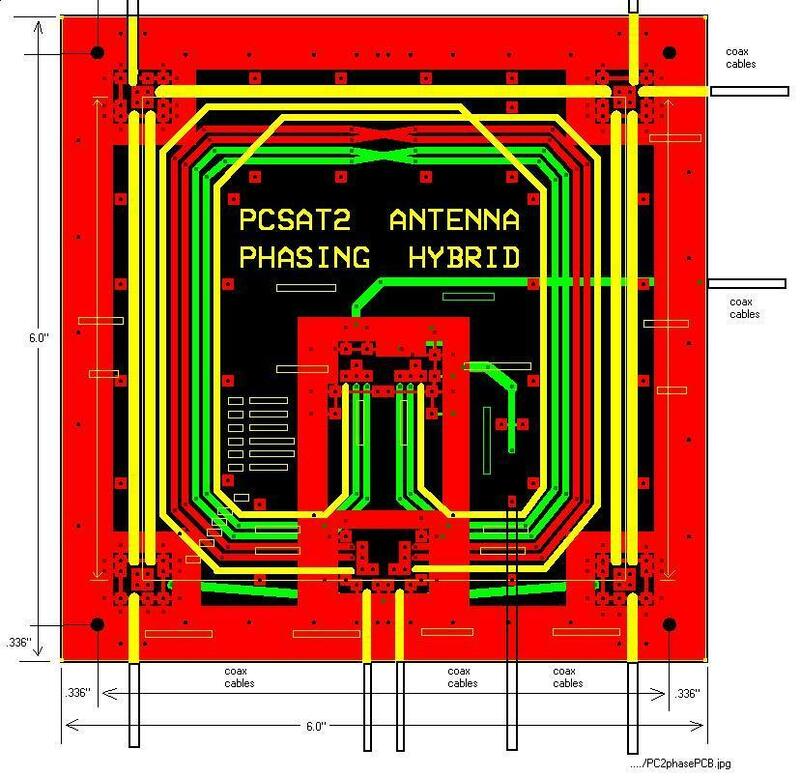 Thus PCSAT2 had to be designed with a UHF downlink to avoid transmitting on 2m, even though downlinks on 2m is much preferred for reaching schools and simple stations and meeting our mission objectives. Until the 1 year PCSAT2 mission is over, we are stuck with this UHF downlink mode. Ultimately, we believe all ISS downlinks should be on 2 meters and have been working from our original paper to that regard. In the mean time, here is a possible old band plan idea. These links are opinions only, and have no credibility with ARISS. 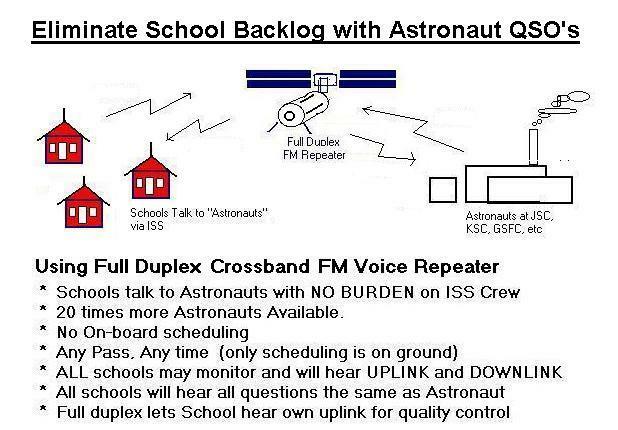 An FM Voice repeater for full duplex special ARISS or crew communications to facilitate school outreach. 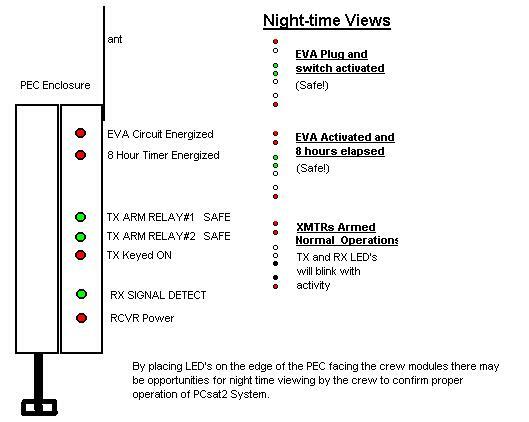 Routine Telemetry on the spacecraft systems. USER RECOMMENDATIONS: As was the case for PCsat, and in accordance with the rules for operation in the Amateur Satellite Service, all duly licensed operators worldwide are welcome to use the PCSAT2 transponders in accordance with the published guidelines. To keep users fully informed of their expected uplink requirements, we have published and maintain an active and current User Service Agreement for guidance to all users. This kind of open publishing of the detailed user expectations pioneered by PCsat was entirely successful and we were very pleased that Amateur Satellite operators worldwide in general adherred well to the recommendations for the benefit of all. 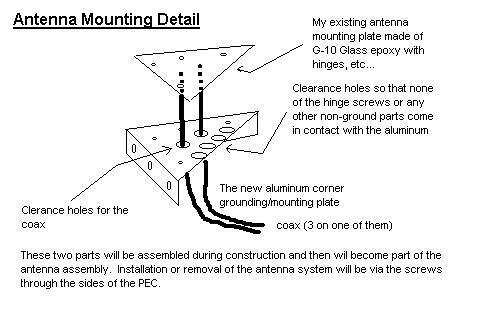 Antenna details:... Plan, Corner Plate, the Drawing and New idea, EZNEC antenna model. Antenna Photos:.... Corner Hinge Assy, Corner PCB and tuning ckts, Closeup details. Antenna Phasing:. 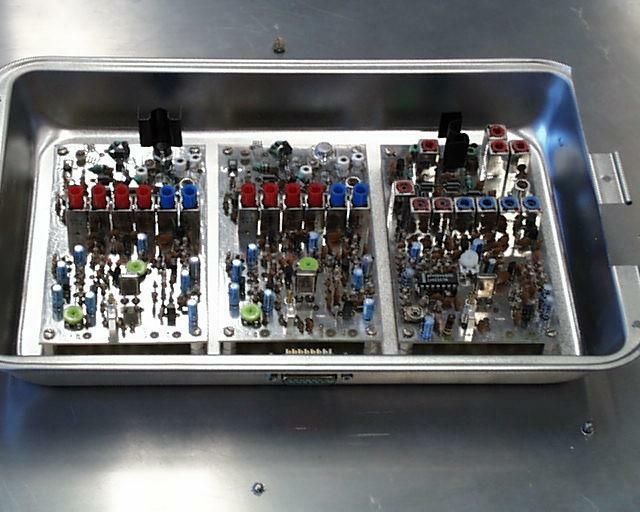 UHF , VHF , Matching Ckt, PCB Layout, T/R sw, Assembly Notes. 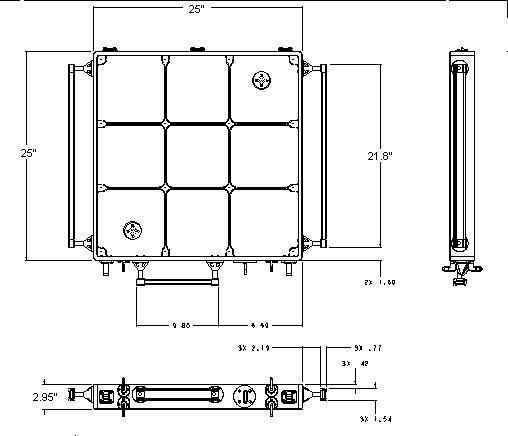 Assembly Plans:... Interface Brd, Phasing Board, Receivers, TXA, TXB, and TXC. Ibrd/TNCs. Communications:. Block Diagram . PSK31 10m RX photo1, Photo2, and Photo3. Frequencies:........ PCSAT2 Operations in the ITU Amateur Satellite Service and the IARU Rules. 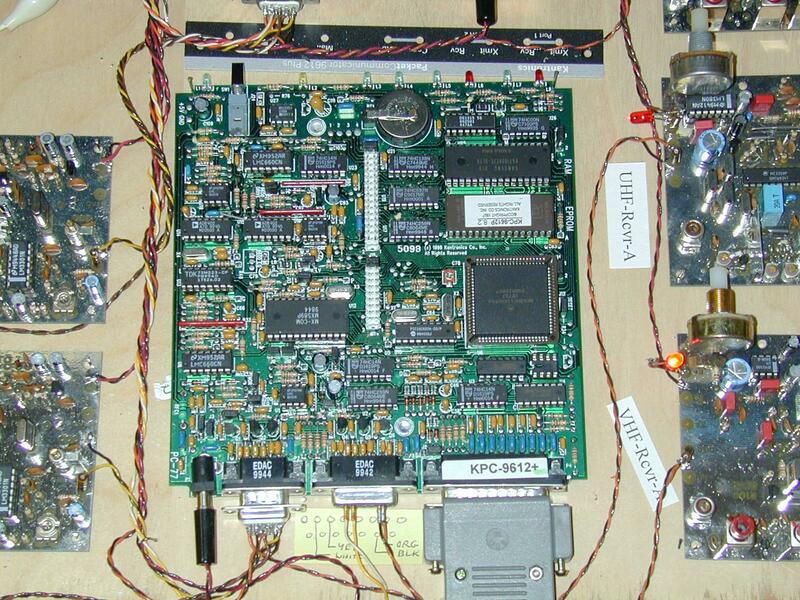 Ground Equipt:... GSE connector, User Equipment, EMI Test config, and GSE Test Setup. Interface Board Audio Ckt, Assy plan. Mechanical Items: Shelf Detail, PEC box, Handrail clamp, and a Connector Location sketch. 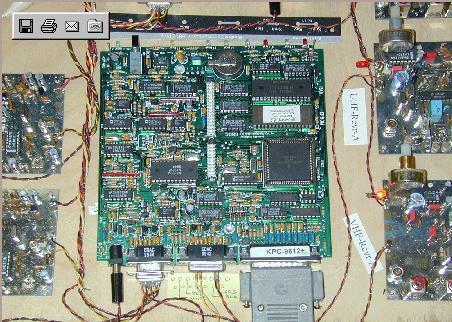 PSK-31 Items:.... Miroslav Kasal's 29 MHz PSK-31 Receiever schematic . Power System:.... Distribution Ckt, Comms Power Budget, and the Actual Power Budget. Prototype Photos:..... Prototype TX and TNC pan. Requirements:...... Initial concept requirements for the AX.25 system. 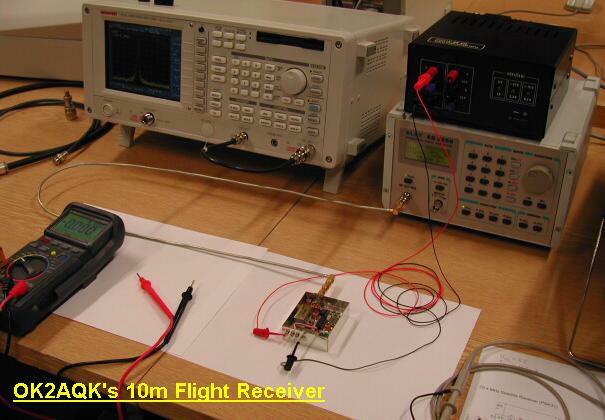 RF Subsystem:.... RF Functional Block Diagram and Frequency compatibility with ARISS. Telemetry Items:... Multiplexer, Telemetry Eqns, and the First TLM data. Unresolved ideas:..Possible LED Status Indicators (not implemented). Wiring Items:......... Cables , Harness , Original Coax , Final Coax , RX internal and TX internal . PCSAT2 TELEMETRY SCREEN: The screen below shows what the PCSAT telemetry screen looks like. Whenever PCSAT2 is on the air, even on the ground in testing, you can monitor the APRS worldwide Internet system and see it. The TNC COMM system (one of 2) and the dual receivers and dual transmitters. The digital communications relay will operate within the ITU regulations for educational/outreach operations in the Amateur Satellite Service, to provide simple Satellite digital communications for amateur satellite operators and educators and possible remote environmental sensors worldwide Examples . This comms mission will provide a follow-on extension to the educational communications mission of PCsat, Boats at sea, cross country travelers, expeditions, or other travelers far from existing APRS terrestrial communications infrastructure. The Transponder and PEC data is captured by existing PCsat-to-Internet ground stations and fed into the existing worldwide internet linked APRS system. 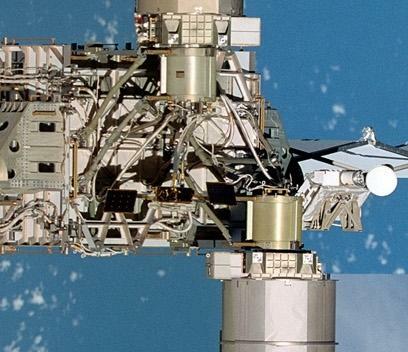 The PEC mission would join ISS, MIR, PCsat and several other on-orbit experiments (ASTARS) that have been conducted over the years leading up to this exciting capability. PHOTO of original RF model with MLI blanket. APRS is the Automatic Packet Reporting System that the Naval Academy uses for tracking its boats and a variety of other vehicles and networks using the APRS Automatic Packet Reporting System . 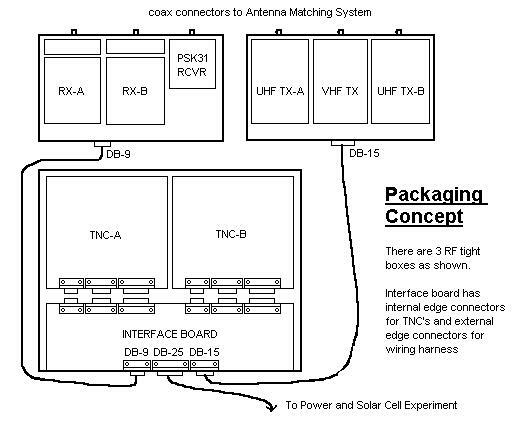 The PEC Communications transponder would be operated under the rules of the Amateur Satellite Service and the rules of the FCC. You are visitor: <== not visible on IE, but NetScape sees it .